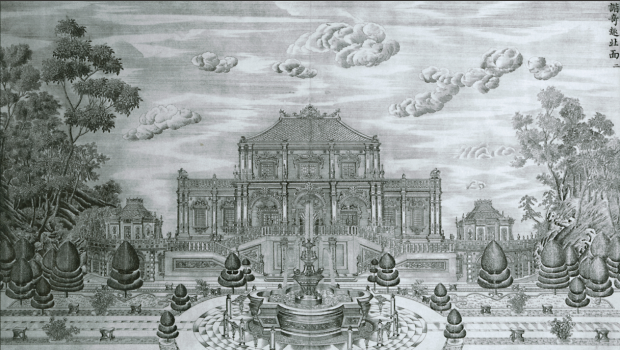 A view of Yuanmingyuan from "The 20 Views," a series of engravings of the palace complex commissioned by the Qianlong emperor in 1783. A series of essays on the history of Yuanmingyuan, by historian Lilian Li, as well an extensive collection of images of the palace complex, is available on MIT's Visualizing Cultures website under "The Garden of Perfect Brightness." For Part 1, click here. For Part 2, click here. On a balmy, moonlit evening in the autumn of 2010, I took my son out to Yuanmingyuan to wander among the ruins. The 150th anniversary of the destruction of “The Garden of Perfect Brightness”—often called the Old Summer Palace—was approaching and I wanted him to see what remained. We savored the wind in the willows, bought spun sugar in animal shapes from a vendor near the entrance, gaped at the gargantuan lily pads that carpeted the lakes, and gawked at a black swan floating in their midst. When we heard music, we followed it to an outdoor stage where “The Legend of Yuanmingyuan” was being performed. Billed as “patriotic education” for children, it consisted of shadow puppeteers and costumed dwarfs reenacting the looting and burning of the palace complex in 1860. Foreigners—played by dwarfs in curly yellow wool wigs—were portrayed as so stupid they couldn’t speak their own languages. Chinese villagers were uniformly brave, defending the Emperor unto death and shouting, “Kill the Foreign Devils! Kill the Foreign Devils!” The dwarfs were not professional actors, but were evidently there to lure an audience that might prefer a freak show to a history book, and the whole event struck me as sordid, sad—and, yet, somehow, unsurprising. Because, a century and a half after its wanton destruction, Yuanmingyuan remains a festering wound in the history of modern China. It was covered over with scar tissue for much of the twentieth century but reopened in the 1980s as the divisiveness of class struggle was rejected in favor of a new sense of unified nationalism. But, even as it has become an icon of patriotic education and a symbol of China’s “humiliation” at the hands of foreign imperialists, it remains a topic of unending controversy. Some argue that the ruins should be either fully or partially restored to demonstrate the glory that was; others counter that such a suggestion borders on sacrilege—only in its ruined state can Yuanmingyuan serve as an appropriate reminder of China’s past humiliation and, by contrast, its resurgence under the Communist Party. Proponents of these opposing sides find common ground when it comes to criticizing the cash-strapped management of the park for allowing such things as the puppet show, the carnival rides, the blaring loudspeakers, the sellers of sausages and trinkets, and the “Imperial Ice and Snow Festival” to which part of Yuanmingyuan is converted each winter. They also come together every few years—as does the general public—when one of the bronze animal heads looted from the water clock in the fountain outside the Hall of Calm Seas is auctioned by Christie’s or Sotheby’s. However, in 2009, even the auctions became a subject of disagreement when Fujian businessman Cai Mingchao bid on the rat and rabbit heads offered by the estate of Yves Saint-Laurent, won them for $19 million each, and then refused to pay—leading some to hail his “patriotic spirit” and others to oppose his maverick action. Gone missing in all this patriotic symbolism, politicized controversy, and rote terminology, is the soul of Yuanmingyuan itself—and the true horror of its desecration. Once upon a time, we all had an excuse for not understanding much about Yuanmingyuan—it was hard to find first-person descriptions of the palace or accounts of its destruction. Delving into several such accounts made me realize, first and foremost, what a disservice the English label “Old Summer Palace” does Yuanmingyuan. Hardly a summer getaway, Yuanmingyuan was the primary residence of five Qing emperors, including Qianlong. Likewise, it was not a mere “palace,” but hundreds of palaces covering an area roughly five times the size of the Forbidden City. Its grounds harbored temples, theaters, libraries, pavilions, gazebos and galleries filled with priceless antiquities, art collections, books, religious objects, and personal belongings. It contained an archipelago of islands, lakes, and mountains—largely manmade—and its beauty was such that nearly every European who saw it was left searching for words. A man must be a poet, a painter, a historian, a virtuoso, a Chinese scholar, and I don’t know how many other things besides, to give you even an idea of it, and I am not an approach to any one of them. But whenever I think of beauty and taste, of skill and antiquity, while I live, I shall see before my mind’s eye some scene from those grounds, those palaces. The never-ending improvements to Yuanmingyuan were overseen by several generations of the Lei Family, and incorporated scenic sites from around China; if the Emperor was smitten by a particular lake, waterfall, library, pagoda, rockery, or—what the heck—mountain while touring his nation, he simply had a copy made at Yuanmingyuan. When Qianlong took his mother on a visit to Hangzhou, for example, she admired the famous vista “three pools mirroring the moon” (which is currently on the back of a one yuan note) so he had it replicated for her at Yuanmingyuan. When his troops conquered Xinjiang and brought back the wife of a defeated prince—a renowned beauty known to history as the Fragrant Concubine—Qianlong had scenes from a Central Asian town built at Yuanmingyuan in the hope of alleviating her homesickness. Yuanmingyuan even supposedly contained a replica of a Chinese town, replete with wall, four gates, streets, squares, houses and a port. At festivals, eunuchs would dress up as merchants, vendors and townspeople—including constables and pickpockets—and the Emperor and his ladies would shop, visit tea and wine houses, and even fend off aggressive vendors of candied haw or caramelized sugar animals of the sort I bought my son. In reading about the glories of “the garden of gardens,” a second, perhaps inevitable thought is the odd juxtaposition of Yuanmingyuan’s historic role as the Emperor’s private paradise and current status as a site of “patriotic education” in a socialist nation. No ordinary person could enter Yuanmingyuan unless he was there to serve the emperor—although plenty were employed in that role, including more than 2000 kitchen workers so specialized in their skills that some were responsible only for salting the dishes cooked by others! I am again occupied in making hydraulic machines for the Emperor… All that is made in Europe of lead or iron or even wood is here made of copper. That which costs in France but ten pistoles, costs the Emperor ten thousand pounds. You can judge the expense, but because of the too hasty execution of the work, one cannot guarantee its solidity. …French infantry, Englishmen, unmounted cavalry, artillery men, Queens dragoons, Sikhs, Arabs, Chinese coolies… this ant-heap of men of every color, of every race, this entanglement of individuals from every nation on the earth, swarm[ed] on this mound of riches, hurrahing in all the languages of the globe, hurrying, struggling, stumbling, falling, picking themselves up, swearing, cursing, exclaiming, while each carried off something. The Chinese government was informed, signs were posted on the city walls, and on October 18th 1860 an infantry division of nearly 4500 men (including four British regiments and the 15th Punjabis) burned Yuanmingyuan to the ground. Flames devoured gilded beams and yellow porcelain rooftops; ash filled the lakes and snowed down on Beijing, where the sky grew so dark it seemed like an eclipse. When the thirty-year-old Xianfeng Emperor heard the news, he vomited blood; less than a year later he was dead. Neither, it seems, does China. But after reading these accounts, it’s a lot easier to understand why.